Publication Information: Harper. 2016. 368 pages. Opening Sentence: "The first sign that order had slipped its axis was that the slave who came to tell us of the murders was riding a horse." Favorite Quote: "I knew the circle of the world, and it had sharp edges." In Conecuch County, Alabama lies a tributary of Conecuch River commonly known by the gruesome name of Murder Creek. The story goes that along that creek in 1788, three men came upon a traveling party and ruthlessly murdered the travelers and ran off with their money. The three perpetrators were the unlikely combination of a white man, a runaway slave, and an American Indian. 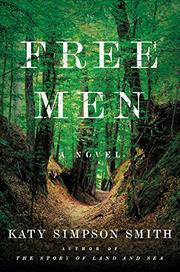 In Free Men, Katy Simpson Smith builds a fictional tale around this incident. It is a story of the murder and of the hunt for the murderers. More than that, this book is a character study of four men. Cat is a damaged, distraught white man running from his life and his grief and searching desperately to belong to someone and to someplace. Bob is a runaway slave, who, in his quest for freedom, leaves his wife and children behind in slavery. Istillicha is an American Indian, forced out of his home and tribe because of internal strife; his goal is revenge and redemption. Chasing this group is Louis Le Clerc Milfort, a European man who is a guide, a bounty hunter, and a student of humanity. In actual chronology, this book covers only a short span of time - March 6, 1788 to March 19, 1788. Each chapter tells the story from a different perspective, primarily that of one of these four men. In their reflections and musings, the book builds the background that leads to this moment. It explains the journey that brings each man to this particular place and this particular action at this particular time. Socially, economically, and legally, these men couldn't be any more different. Through their diverse backgrounds, the book creates an image of how different life was at the time depending on the color of your skin and your upbringing. Cat is an orphan, passed from caretaker to caretaker, living in poverty and with no stability. Bob is born into plantation work and into slavery and all the horrors that entails. Istillicha is the offspring of tribal leadership, but infighting and war lead to a dramatic change in his position. Le Clerc is a French nobleman, with the rights and privileges that come with that identity. As different as these men are, their stories have dramatic similarities also. Their stories all go back to childhood and all involve the women in their lives. Elements of love are found as are elements of physical and emotional abuse. A sense of desperation seems to follow all four men as well. Perhaps, it is these similarities that draws Cat, Bob, and Istillicha together on their journey. Despite the horrific crime and despite Le Clerc's admission of his actions in the name of justice, the book elicits pity for all four men. The writing makes this story intensely personal. Despite the fact that the point of view shifts with every chapter, the book manages to remain very personal and very connected throughout. Underlying the entire book, as the title implies, is the concept of freedom and what form that may take. Freedom from slavery. Freedom from the expectations of others. Freedom from our own memories. Freedom to forge our own path. Freedom both literal and figurative is at the heart of these men's stories. The essential question of the book because that of freedom. Does each man attain what freedom means to him and will you, the reader, agree with that definition of freedom and with the cost of attaining that freedom? The book will leave you thinking about that question long after it ends. Publication Information: Spiegel & Grau. 2016. 352 pages. Opening Sentence: "Tomás decides to walk." Favorite Quote: "Love is a house with many rooms, this room to feed the love, this one to entertain it, this one to clean it, this one to dress it, this one to allow it to rest, and each of these rooms can also just as well be the room for laughing or the room for listening or the room for telling one's secrets or the room for sulking or the room for apologizing or the room for intimate togetherness, and, of course, there are the rooms for the new members of the household. Love is a house in which plumbing brings bubbly new emotions every morning, and sewers flush out disputes, and bright windows open up to admit the fresh air of renewed goodwill. Love is a house with an unshakable foundation and an indestructible roof." Three parts to the book. Three time periods. Three stories that ultimately tie together, although not until the end and even then only sort of. Themes of sorrow, a loss of faith, the mountains of Portugal, and chimpanzees run through all three stories. Part one is the story of a man walking backwards and his quest. Part two is discourses on Jesus and on Agatha Christie. Part three is about a man and his chimp. Throw in a crucifix, some untimely deaths, and a rhinoceros to complete this book. In Part One, we meet Tomás, who is reeling from the tragedy of losing both his wife and his toddler. His response to his sorrow and his anger is to start walking backwards. Yes, walking backwards in his normal day to day life. This way, he only faces something by choice rather than coming upon it by chance. Denial or loss perhaps? I am not really sure, but I suppose I could see the symbolism in that. In addition, he fixates on a religious artifact he reads about in an old diary written by a priest. This artifact is to be found in - you guessed it - the high mountains of Portugal. So, he begins a quest to find it. The quest, however, becomes more about his ability or inability to drive a car, a new-fangled invention. Perhaps, the fixation is a way of coping with his loss; if he can focus on this car and this artifact, then he doesn't have to think about his loss. Is that the interpretation the author intends? I am not sure, but the explanation works for me and makes Tomás a character for whom I feel pity. Then, Part One ends. Part Two, 30 years later, becomes about a death and autopsy. In between, we have the pathologist and his wife's musings about Jesus and Agatha Christie. The autopsy reveals inside the human body a chimpanzee cradling a bear. What? I am not sure quite what to make of this. Abruptly, this section ends. Part Three, fifty years later, is also about a man recovering from loss. His method of coping is to retreat from society to live with his chimpanzee. This story becomes about the interaction about man and animal and the ability to heal, powerful themes with great potential to develop into a story. By this point, however, I am still looking for the thread to tie the book together and to make sense of it, but perhaps it is too late at this point. I am not vested in the characters, the story, or the why. Confused yet? Me too. I am not entirely sure what this book was about. All through the book, I feel as if there exists a metaphorical, philosophical meaning behind the words. All through the book, I wait for it to become clear. All through the book, it remains beyond my grasp. Having finished it, I wish someone could explain it me. I wish for that "a-ha" moment to have it all make sense. Unfortunately, for me and this book, it never happens. Publication Information: Columbia University Press. 2012 (original Italian). 2016 (English translation). 176 pages. Opening Sentence: "This essay stems from a long exercise of observing the ways in which people encounter food and perceive it." Favorite Quote: "Etymologically the word diet - from the ancient Greek diaita - meant way of life, matters related to daily activities such as physical exercise, sleep, sexual activity and, of course, alimentation. Food played a great role in diet, so much that 'dietetics' then came to indicate that branch of medicine that deals with food." This book, or essay as the author refers to it, states as its thesis, "Taste is situation, circumstance, and ecological experience." The book "is therefore an attempt to approach food not as an object of study among others, but rather as a matter of a specific system that requires a specific narrative." Given this premise, the book approaches taste as human experience from three different directions or three "modes of access:" pleasure, knowledge, and indifference. These three form the basis of the three main sections of the book. 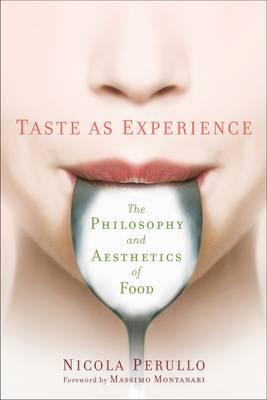 Pleasure comes in many form and from many sources; the book speaks to the relationship between the inherent pleasure of food and the role of emotional and social paradigms to influence that experience. The book brings examples from scientific studies and from literature; some I understand, and some I find myself skimming through. My layman's example is how a particular food - in physical taste, smell, or presence - can trigger a pleasurable memory or how I label certain foods as comfort foods. In other words, the pleasure of a food comes from its inherent qualities but also from our associations with it. I am not sure that is where the author is going, but the idea makes sense in my limited understanding of the book. Knowledge as the basis of a taste experience uses the example of the wine connoisseur. The experience of the wine comes to the individual through his or her understanding of the different notes in the wine and the training and study that goes into being able to distinguish the flavors. This element is the access to food used in food tasting, wine tastings, tea tastings, and other such events. An individual's experience is dependent on the knowledge they bring to the food. Indifference as an explanation of experience is again explained through examples from philosophical and literary texts. Indifference comes in many variations such as a situation impacting an individual's experience with a food; distractions removing the focus from the food; and an individual's lack of interest. This book is considerably more academic than the cover would imply. I can't say that I am surprised though. Columbia University Press is a well-respected academic publisher. Nicola Perulla is an associate professor of Aesthetics at the University of Gastronomic Sciences in Pollenzo, Italy. The language used and the depth of information covered indicates that this is not the book for a reader with a casual interest in the topic. The author pulls elements from philosophy, anthropology, history, and psychology to draw comparisons and conclusions. This book is a great reference source for anyone with an academic interest in the topic. If you have a general interest in the topic, you may find yourself skimming the book or looking for a different one. The book may be difficult to understand, but main idea is not. Repeatedly, the book comes back to its thesis - taste is not just about the food; it is about the interaction of the food with an individual at a particular time in a particular situation. The final section of the book draws these three threads together back to the main thesis and leaves the reader with some advice as to how to keep and develop our experiences of taste in ways that are healthy both for us as individuals and for the world we live in. Publication Information: Clarkson Potter. 2015. 304 pages. Opening Sentence: "At five o'clock every morning, while most people in New York City are still dreaming, industrial mixers are spinning inside Hot Bread Kitchen in East Harlem." Favorite Quote: "To riff on a classic proverb, we teach women to fish. But we also show them how to fillet their catch, batter and fry it, and then sell their fish with an appropriate markup." The Hot Bread Kitchen Cookbook, as the title implies, is a book about bread making - recipes, tools, and techniques. The recipes in this book, though, go well beyond bread; the book includes many recipes for the dishes ranging from curries to salads that we make and serve with bread. This book goes further beyond just a cookbook also. It is a business book, including tips and lessons learned from starting and running this enterprise. Going even further, this book is a story of the bakers of the Hot Bread Kitchen. Located in East Harlem, the Hot Bread Kitchen looks like many other bakeries around the city. Within, however, also thrives a "social enterprise that provides a life-changing education and opens doors for low-income minority women. The social part of the equation means that bakery trainees learn the skills they need to get management-track positions in the food industry or to start their own food businesses. The enterprise part means that we use the money earned from each loaf of bread to pay for training. Our business pays for our mission." The diversity of the bakers leads to the diversity of the recipes found in this book. The first section alone has recipes from Moroccan, Bangladeshi, Indian, Polish, Jewish, and Armenian traditions. Since the recipes in this book originate with the bakers' traditional home recipes, most of them seem very accessible for a home cook with recognizable and easily available ingredients. The recipes themselves seems "homey" rather than "chef-fy," but as someone who learned how to cook from my mother and grandmother, I love that. The recipes I have learned from experience are the ones I return to time and again, and that is what I feel this book brings - the warmth and comfort of home. Honoring the diverse backgrounds of the bakers, many recipes include notes on variations to make it appropriate to particular people - for example, explaining matzo recipe and what makes it Kosher or not Kosher for Passover and a non-alcoholic version of a bread suitable for Muslim bakers. This respect for tradition and diversity permeates the entire book. Yes, in this day and age of recipes everywhere, these recipes can probably be found in other places as can most recipes in most cookbooks. What makes this cookbook special is the stories it tells behind the recipes and the mission it serves. I was not familiar with the Hot Bread Kitchen prior to receiving this book, but I am so glad I am now. For its mission alone, this book is worth purchasing and supporting. The delicious recipes are an added bonus. Opening Sentence: "The patter of rain against the blacked-out stained glass dome above where I sat numbed me like a hypnotist's gold watch." Favorite Quote: "Do I want to know where I came from? Yes. But that doesn't impact who I want to be. My past - that's the work of other people. What I do - that's up to me." Three time periods. Three heroines. Three interrelated love stories. Three authors. The Forgotten Room is a collaboration between bestselling authors Karen White, Beatriz Williams, and Lauren Willig. I don't know if each wrote one of the time period or if the collaboration occurred in a different way. The story flows seamlessly together without differences in the writing style, the pace or the tone of the story. In 1892, we have Olive. This story is a story of revenge and a story of the social classes. Olive is a maid in the Pratt household; Harry is one of the Pratt boys. Olive brings a history and a secret that leads her to take the position in this particular household. The conclusion of that secret is the only surprise in Olive's story. The rest proceeds as a typical upstairs and downstairs story. In 1920, we have Lucy. This is the story of a search for the past and the story of a young woman seeking an independent life. Lucy is a secretary for an attorney. She brings a history and a secret that leads her to take this position with this particular firm. For Lucy comes the choice between John Ravenel and Philip Schuyler. Given Kate's last name, it's clear how Lucy's story ends. The only open question is why. In 1944, we have Kate's story. This is a story of war and of a young woman looking to create a career in what is still a man's world. Kate is a doctor in a time when women typically did not enter the field. She is fighting the battle to be accepted for her qualifications both by the male doctor and the female nurses. Along comes Cooper Ravenel, an injured soldier who behaves as if he has seen Kate before. Can Kate's independence co-exist with a relationship? That is the choice facing Kate. The book moves in rotating chapters between the three stories. Since the timeline of the stories is clear and the connection between the three becomes clear quickly, the endings of Olive's story and Lucy's story are a foregone conclusion. That removes any suspense from their stories, but they are still enjoyable to read for each chapter moves just a bit closer to that conclusion. This book is a neatly, packaged tale. Common thread binds all three women and the men who enter their lives. The shared history comes through relationships but also through the setting of the book. The Pratt mansion becomes a women's boarding house for Lucy and a wartime hospital for Kate. The forgotten room in the attic becomes the place with all three stories unfurl. Sometimes, the parallels between the three are too closely linked. Each woman has a societal norm against which they struggle. Each has a love that may or may not become her future. The book has no big surprises, no real twists, and a predictable conclusion. Sometimes, that is just what you need. A cozy book, a cup of tea, and a comfy couch to create a lovely afternoon escape. Publication Information: Picador. 2016. 320 pages. Opening Sentence: "Around the world, people are increasing beset with vexing conditions like obesity, type 2 diabetes, gout, hypertension, breast cancer, food allergies, acne, and myopia." Favorite Quote: "The robustness of meat-eaters and the long lives of meat-abstainers are two sides of the same biological coin. It all depends on how you define healthy. Does healthy mean being in a great mood and being fertile and stronger at a younger age, or does healthy mean dealing cancer for a couple of years and hanging out with your greatgrandchildren? This is a question that each of us - and especially parents-needs to carefully consider." Part history, part memoir, part fun facts, part guidance on how to eat. This book covers a lot of bases. The premise of the book is as follows: "Without understanding the evolutionary history behind humans, trying to determine the optimal diet is like trying to decipher a difficult text by only reading one page; only evolutionary theory provides the means to understand how all the components of an organism's life are linked together, including nutrition and health." The book gives a broad tour of world cuisines and foods consumed around the world. For each food, the book talks about how it was or was not part of our ancestor's diets, how it is or is not part of our modern diet, its health pros and cons, and the role the food can play in our diet. Portions of this book read like a travel food memoir, tempering the facts with personal stories. For example, the first chapter begins with insects. The book's argument is as follows. Insects were and are part of many societies' diets. They are a nutritious and eco-friendly food. The book backs up this statement with facts about the nutritional profile of insects and about the environmental efficiency of farming insects as compared to traditional sources of protein. In talking about insects, the book begins in Saigon with an invitation to eat insects. It proceeds to a description of that experience and of people's willingness or unwillingness to try the food. The story then moves to trying different types of insects and to visiting a cricket farm. These personal stories lighten the book and interject breaks amidst the science of the book. Of course, the book moves much beyond insects, taking on food after food - fruits, meat, fish, dairy, etc. The concept for each remains the same - a presentation of a premise, a anthropological look at the food's consumption, a recommendation and the science to back it up, and personal stories to tie the whole thing together. In this survey look at foods, the book also takes on some diets popular at this time. In particular, the book makes a statement against the Paleo diet. Like this book, the literature supporting the Paleo diet claims to return to the way our ancestors ate. So, what's the difference? "The Paleo diet looks and sounds evolutionary, but some paleoanthropologist dismiss it as overly simplistic, a caricature of actual evidence - like dividing the world into good guys and bad guys." This sentiment repeats several times during the book along with the solid advice that "fad diets don't work." This book is a surprisingly quick read. About 30% of the book (per my ebook pagination) is the end notes so it is shorter read than the page count implies. I learned much from the science and may incorporate some ideas - no insects though - into my family's diet. I really enjoyed Stephen Le's personal stories and hope to read more of a travel memoir. As a diet prescription, the book does not offer anything new. This is fine though because ultimately "the final message: Eat good food, keep moving, and let your body take care of the rest." Publication Information: Simon & Schuster. 1989 (original publication). 432 pages. Book Source: I was introduced to this book by a manager years ago and recently re-read it. Opening Sentence: "In more than 25 years of working with people in business, university, and marriage and family settings, I have come in contact with many individuals who have achieved an incredible degree of outward success, but have found themselves struggling with an inner hunger, a deep need for personal congruency and effectiveness and for healthy, growing relationships with other people." Favorite Quote: "Love is a verb. Love – the feeling – is the fruit of love the verb or our loving actions." A manager introduced me to this book years ago. I was young and newly out of school, looking to steer my career. The manager was a big believer in Stephen Covey's work and in the philosophy of this book. At the time, I read it. I nodded in agreement with most of the ideas. The ideas are not new and were not even then. Once I read them, they were even intuitive, eliciting the reaction, "Well, of course." I read it in deference to my boss and then put it aside. The manager moved on. I moved on. School changes. Job changes. Family changes. Changes in life direction. Over the years, I found myself (and still find myself) drawn back to the paradigm presented in the book. It is an ideal, but it is an ideal that makes sense. Do I find myself able to implement each habit to its fullest? No, and maybe I never will. However, the principles provide a way to center my thoughts and ground myself. I find this to be true in my personal and professional life. That is why this book finds a permanent home on my bookshelf and why I still find myself recommending this book to others. So what are the 7 habits? The first three habits are internal, focusing on you as an individual or what the book terms "private victories:"
Be proactive - Take responsibility for your choices. Begin with the end in mind - Determine the unalterable guiding principles that govern your life and set your goals to align with those principles. Put first things first - Ensure that your time and efforts are invested into endeavors that are important to your goals. The next three are more external, focusing on your interactions with others, whether personal or professional. The book terms these "public victories:"
Think win-win - When engaging with people, think of a third alternative that allows both individuals success in the interaction. Seek first to understand, then to be understood - Seek truly to understand the speaker without imposing your own judgement or interpretation. Synergize - The whole is often greater than the sum of the parts. The final habit - Sharpen the saw - recognizes that we can only attain private and public victories if we first take care of ourselves. That care exists on multiple levels, addressing our physical, mental, social, and spiritual needs. What I love about this paradigm is that it is so simply explained. The book reinforces the ideas with numerous professional and personal examples. Note that most of the personal examples are based on a parent-child relationship and may not be as relatable to a different audience. Nevertheless, the philosophy still applies. The book also talks about the tools you can employ to live the seven habits. Stephen Covey built an entire business around tools such as planners and workshop to teach people how to implement these ideas. The book, however, focuses on the qualities such as portability and flexibility a tool should have. As such, the information in the book has not become dated. Our tools have become more and more powerful with the incorporation of technology. We have more at our fingertips, but each one of us still has to determine their best use for our goals. Stephen Covey passed away in 2012, but he left us the legacy of his work, and I, for one, am thankful.